When J and I moved into our new place, we bought this big awesome dining table that seats 10 people. Rather ridiculous considering it takes up nearly half of our living room space, but we were determined to entertain! It was a glorious meal, sans the fruit flies that decided to hatch in my mushroom growing box and terrorize us by dive-bombing our wine glasses. Though I must say, that’s a great way to go. Drowning in a juicy zin. We started with this incredibly easy roasted feta with thyme honey, Castelvetrano olives, and a nutty, oily manchego smuggled in from M’s Spain trip. Heaven. For our salad course, we did a super easy romaine with April Bloomfield’s lemon caper dressing featuring whole segments of lemons, capers, shallots, and mustard. I loved the idea of the dressing, but in practice it was just too darn mustardy to the point where it reminded me of the stanky smell of a Burger King whopper where the yellow mustard had been warmed by meat. Okay, I’m being a little extreme. Everyone really liked this salad except me. For our main course, I decided on halibut en papillote. I prepared 8 individual packets ahead of time and popped them into the oven, while we enjoyed our cheese. It couldn’t have been easier and I could tell everyone was pleased to have a toasted parchment gift to tear open at their place setting. The halibut itself was perfectly cooked and delicate in flavor, since J and I trekked over to Tokyo Fish Market in Berkeley for the best of the best. Place a thin layer of fennel slices in the center of a foot-long piece of parchment paper. 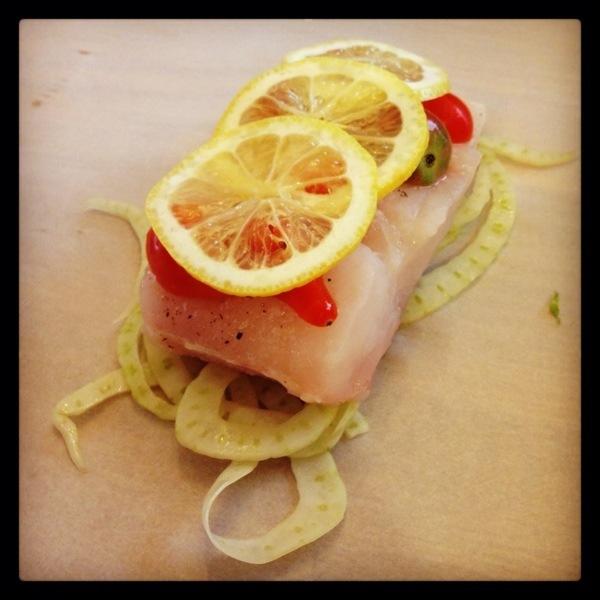 Lay one piece of halibut on your fennel pile. Season with salt and pepper. Top with a layer of cherry tomatoes cut-size down. Top with 2-3 slices of lemon. Place pieces of butter on top of the lemon and finish with a splash of white wine. Begin sealing your packet by folding your parchment paper in half, from left to right, over your fish like a book cover. Start at the fold on at the bottom left and folder the corner over to form a small triangle. Continue folding over 1-inch sections of the paper at a slight angle, like the folds of a fan. As you work your way around the rectangle, you’ll notice you’ll begin to form a half-moon shape. When you come to the end, twist it like a butterscotch candy wrapper until your package is sealed airtight. Bake at 425 F for around 12 minutes depending on the thickness of your halibut. Serve your parchment packages unopened and let guests tear open their own portions. Bon appetit!